Game of Thrones 8: Watch new teaser trailer and know the date of the Premiere. HBO recently unveiled the premiere date for the eighth and last season of Game of Thrones. In an over one-minute long teaser footage just before the debut of season 3 of True Detective, HBO made the announcement about the premiere date. The final season of fantasy series Game of Thrones is finally coming back on April 14, 2019. Taking to its official Twitter handle, the makers have recently revealed that the final season of the GOT will consist of six episodes and each episode will take the level of thrill and suspense a level up. The teaser video shows siblings Jon Snow (Kit Harington), Sansa (Sophie Turner) and Arya Stark (Maisie Williams) walk through the crypts of Winterfell. 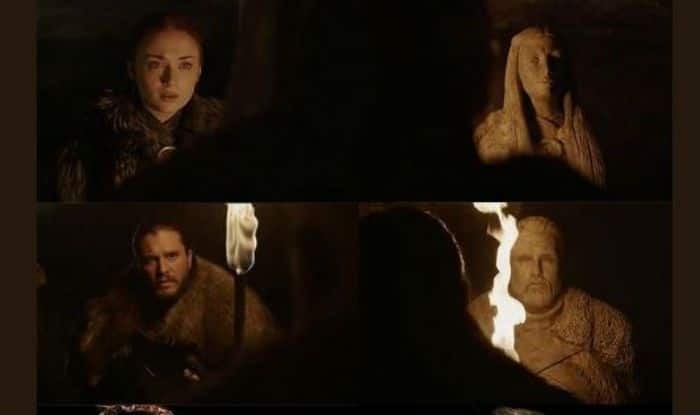 They can be seen hearing the voices of their dead family members Ned and Catelyn Stark as well as Lyanna Stark, who is Jon’s mother that he never knew. The three arrive at the end of the hallway, where they see their own statues as frost approaches through the tunnels. The teaser is dubbed as ‘Crypts of Winterfall’, which will definitely make you crave for new Game of Thrones episodes. Fans of GoT are excited with the new promo as well and have been posting their reactions on Twitter. Here are a few.